As far as galaxies are concerned, size can be deceptive. 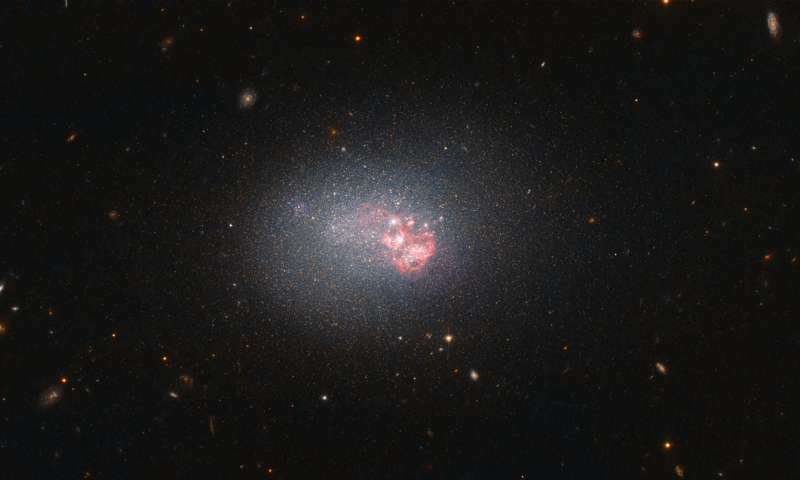 Some of the largest galaxies in the Universe are dormant, while some dwarf galaxies, such as ESO 553-46 imaged here by the NASA/ESA Hubble Space Telescope, can produce stars at a hair-raising rate. In fact, ESO 553-46 has one of the highest rates of star formation of the 1,000 or so galaxies nearest to the Milky Way. No mean feat for such a diminutive galaxy! Clusters of young, hot stars are speckling the galaxy, burning with a fierce blue glow. The intense radiation they produce also causes surrounding gas to light up, which is bright red in this image. The small mass and distinctive coloring of galaxies of this type prompted astronomers to classify them, appropriately, as blue compact dwarfs (BCD). Lacking the clear core and structure that many larger galaxies—such as the Milky Way—have, BCDs such as ESO 553-46 are composed of many large clusters of stars bound together by gravity. Their chemical makeup is interesting to astronomers, since they contain relatively little dust and few elements heavier than helium, which are produced in stars and distributed via supernova explosions. Such conditions are strikingly similar to those that existed in the early Universe, when the first galaxies were beginning to form. one of the highest rates of star formation...since they contain relatively little dust and few elements heavier than helium, which are produced in stars and distributed via supernova explosions. Such conditions are strikingly similar to those that existed in the early Universe, when the first galaxies were beginning to form. Likely such a rapid star-forming galaxy has a super-active supermassive core star ejecting new matter therefrom from which clusters form. Such a core may not yet grown massive enough to have then split into dual cores each of lesser mass with reduced ejection activity. So this galaxy may represent a likely less common intermediate stage of rapid galactic growth with a single very active core. That relatively few metals exist results from the fierce production of new matter, being overwhelmingly hydrogen, being produced within and ejected from the core star. So it is a simple ratio problem. The younger galaxy then has had little time to supplement the production of metals from explosive reactions from within the core star, which occur with increasing frequency as it grows even more massive. And there has been little time for nova explosions to supplement the young galaxy with even more metals. So this is the reason it looks like it has existed since the fabled beginning. And this is the reason some local stars are mis-categorized as being very old. These stars are simply growing from within very rapidly, thereby decreasing the ratio of metals to non-metals. OK, tell me this is not logical? If you start with a different premise for physics, and test it against recent observations, and it seems to fit most observations when conventional models do not, shouldn't said premise be considered? Not by the merger maniacs! Afterall, they are principally intellectual egomaniacs! They are not interested in being wrong.